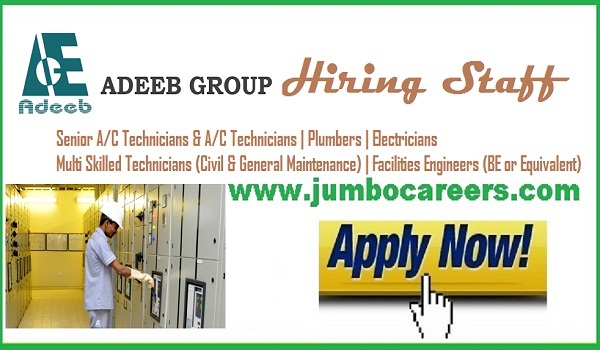 Leading Facilities Management Co Hiring For ADNOC Project (100 Vacancies) Urgently. About the Company : ADEEB GROUP, a leading ISO 9001, 14001, OHSAS 18001 (IMS) certified, TQM and SKEA 2015 (Silver Category) awarded Facilities Management and MEP Contracting Services company headquartered at Abu Dhabi, established in the year 1994, a part of M/s. Sultan Bin Rashed (SBR) Group of Companies owned by His Excellency Sultan Bin Rashed Al Dhaheri, a visionary successful leader who have contributed and complemented the society with the vast developments since 1968 that has achieved great economic boom and growth in the country.